The first thing that came to mind when I came here was the expression “small but perfectly formed”. Recommended by friends who live in Barceloneta this has been one of my favourite places to eat for some time. 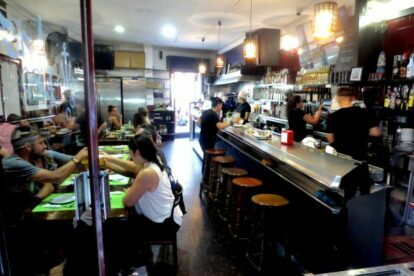 Especially on weekends after a walk along the beach or taking friends from abroad for a visit of this very traditional Barcelona neighbourhood. If you go past the main bar area, at the back lies a sweet outside space with tables which is open all seasons. Great for my smoker friends who can enjoy that rarest of pleasures these days, smoking while sitting down at a table. If the place is full, the staff will put your name on a blackboard, the street is quiet so it’s a perfect place to stand and wait for your table as you sip a vermouth until you get called. Bitacora is well known locally for its fusion tapas that mix traditional staples like padrón peppers (my mouth waters just saying that) and more hip additions like ceviche or tuna tartar. Always ask for the days specials, the friendly staff tend to speak good English and can guide you through the menu. The place has an unpretentious relaxed atmosphere which I love and evidently so do many others as it is always well attended. Give it a try and enjoy their dishes based on fresh ingredients and cooked with great flair. Oh and a second, more spacious Bitacora has opened in Poblenou, life just gets better.